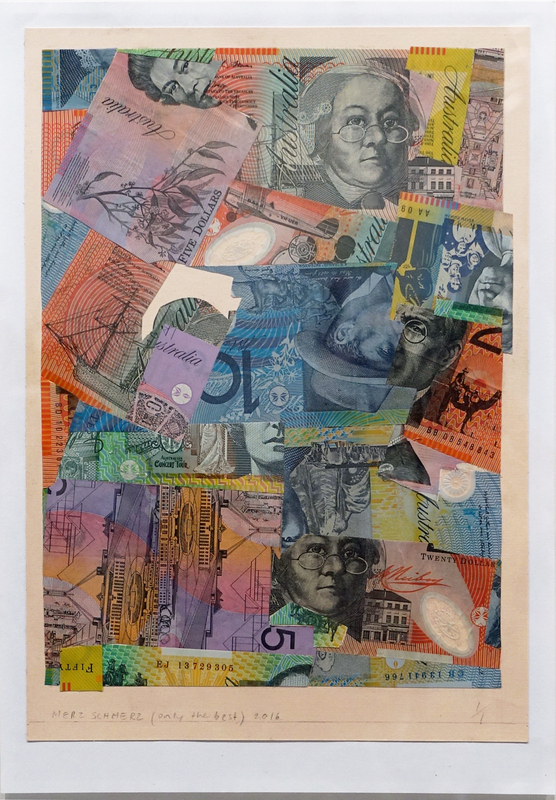 ‘Fundraiser’, 55 Sydenham Rd, Marrickville, curated by Iakovos Amperidis. 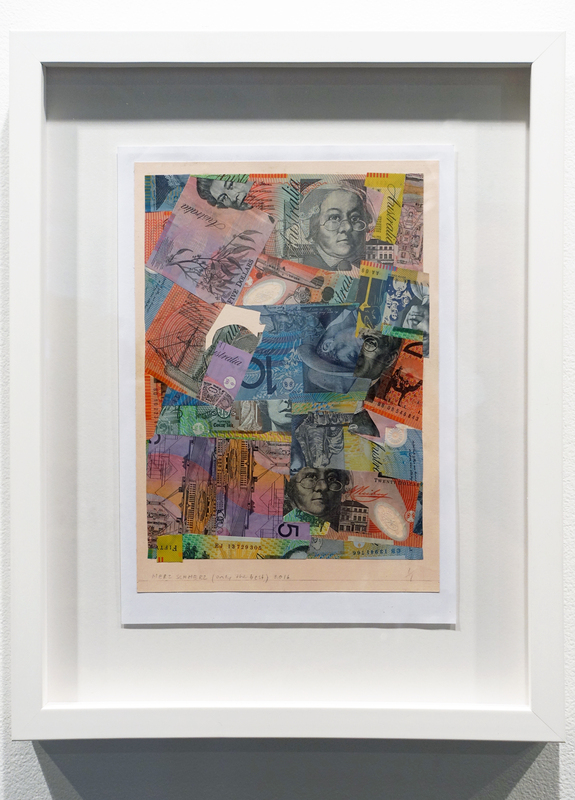 This work painstakingly recreated the composition of one of Kurt Scwitters’ famous Merz collages from 1930 except in this instance using real money. Seminal Dadaist Schwitters was perhaps best known for his ‘Merz’ collages and paintings. In these Schwitters deployed many banal found objects from train tickets, to napkins to match-books and canned food labels. The word Merz was drawn from Kommerz (German for commerce). In true Dadaist spirit Schwitters’ works questioned traditional conceptions of artistic value by incorporating rubbish. In them rubbish was transformed into art, into Culture. Today such transformations have become so commonplace and their value so ambigiously relative that their critical impact has been greatly diluted. In Merz Schmerz Schwitters’ Modernist process is reversed; value (as literalised by money) is transformed into rubbish (money cut-up). Painstakingly retaining the formal composition of Schwitters’ original, the work asked what the value of art is when the hidden game of investment speculation, that propels the globalised art market, is foregrounded. Is the work less valuable for this fact if the work can only be valued according to the actual worth of the materials (in this case money) used to produce it? The Schmerz (Pain) of the title is accounted for by this very contemporaneously accute dilemma. Can contemporary art amount to more than its speculated (hierarchically arbitrary) value?